Heat oven to 350°F (325°F for dark or nonstick pan). Spray bottom only of 8- or 9-inch round pan with cooking spray (without flour). In large bowl, beat all cake ingredients with electric mixer on low speed 30 seconds, then on medium speed 2 minutes, scraping bowl occasionally. Pour batter into pan. Bake 41 to 46 minutes or until toothpick inserted in center comes out clean. Cool on cooling rack 10 minutes. Run knife around side of pan to loosen cake; remove from pan to cooling rack. Cool completely, about 1 hour. In medium bowl, beat powdered sugar and 1/4 cup butter with electric mixer on low speed. Stir in coconut extract and 1 tablespoon milk. Gradually beat in just enough remaining milk, 1 teaspoon at a time, until frosting is smooth and spreadable. Split cake horizontally to make 2 layers. On cut side of bottom layer, spread lemon curd; top with 1/2 cup of the coconut. Cover with top layer. Frost top and side of cake with frosting. 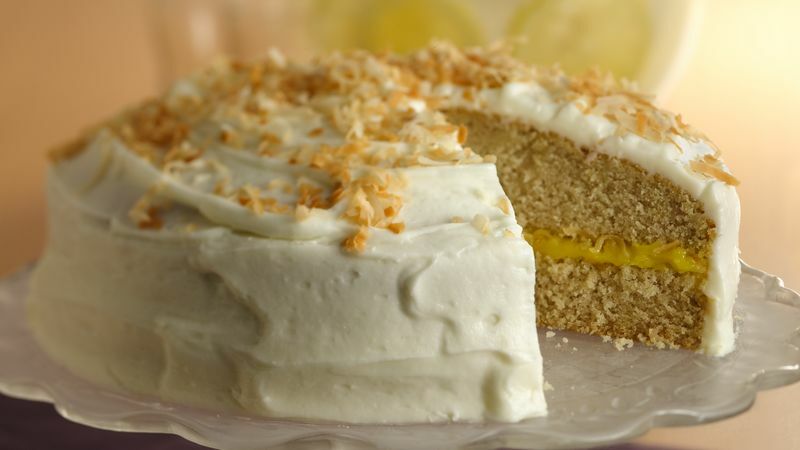 Sprinkle coconut over top of cake. Refrigerate loosely covered. To toast coconut, spread in ungreased shallow pan. Bake uncovered at 350°F 5 to 7 minutes, stirring occasionally, until golden brown. Look for lemon curd in the jams and preserves aisle of the grocery store. Most stores stock lemon-flavored curd, but try orange or raspberry curd if it’s available.